« Question of the Week: Are there any Lessons to Be Learned from the Rogoff-Reinhart Kerfuffle? A recurring feature on this blog is the US vs UK government stupidity contest, which features examples of idiotic behavior by politicians and bureaucrats on both sides of the Atlantic. Recent winners of this dubious honor include a rather amazing example of British road painting and a horrid incident of anti-gun political correctness by American school bureaucrats. Our neighbors to the north must be envious that they’re not part of this contest. Based on what just happened in Quebec, Canada probably deserves to be in the conversation. First some background, courtesy of a story from the Guardian. It seems that the provincial government actually has language police. 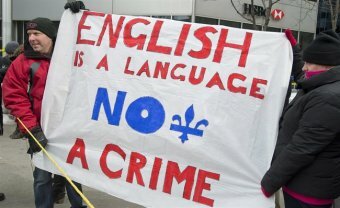 They are known as the language police, a unit within the regional Quebec government that seeks to protect French from the rising tide of English. It deploys inspectors to rein in recidivist anglophones, take on big corporate transgressors such as Guess, the Gap and Costco and conduct spot checks to follow up thousands of public complaints. But sometimes, these tax-funded Keystone Cops go too far. 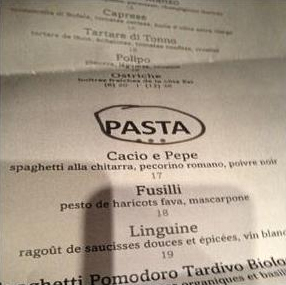 Now, however, zealots in the Office québécois de la langue française (Quebec Board of the French Language) may have gone a step too far in picking a fight with an Italian restaurant… After a five-month investigation into an anonymous complaint, Massimo Lecas received a letter from the board telling him that his establishment, Buonanotte, had broken the law by including the words “pasta” on the menu and “bottiglia“, the Italian word for bottle, instead of the French word bouteille. Outraged, Lecas posted the letter for 2,500 of his Facebook friends to see. In doing so, he unleashed a political tempest over one of the most sensitive topics up for debate in the province. The outcry has forced the Quebec government to rein in its language inspectors, ensure exceptions to the rules are made for ethnic food and restaurant menus and order a review of how it handles public complaints. By the way, this is not an isolated incident. Lecas’s decision to go public with the letter from the language inspector has prompted other restaurateurs to come forward. One told how he was ordered to cover his microwave’s on/off switch and the redial button on a telephone with tape because they were in English. The chef’s grocery list, which was written on a kitchen chalkboard, was also found to have broken the law: steak frites may be a staple of Parisian bistros but, according to Quebec law, biftek is the only acceptable term. …Quebec’s recent budget included one notable increase: the yearly allotment for the language police. So Canada definitely can make a claim that it belongs in the government stupidity contest. Though, to be fair, I should acknowledge that other governments also merit consideration. In the European Union, watching free soccer broadcasts is now a human right. The moral of the story is that government – in all nations – is a festering black hole of waste. And if you ever feel that these incompetent and foolish people deserve more of our money, then I suggest you move to France, where the nation’s President generously has promised that nobody will have to surrender more than 80 percent of their income to the government. Ah- Paris in the spring…C’est la vie. It is likely that voters will recognize the excess and vote for amendments, like which exact words are exempt, under what circumstances and by whom, the process through which an application for exemption can be filed etc. Politicians will be more than happy for the additional demand for political services as they try to sort one more thing out, debate, bring to vote, impose etc. The bottom line is that “The People” have decided to impose French and thus individuals must confirm to this central plan. All is left now is to figure out the details of the law. Debate-vote-impose, lather rinse and repeat until you’ve become a pitchfork democracy — and decline. Well before the dreaded greenhouse gasses add another terrible degree to world temperature, the advantage myopic western world voter-lemmings enjoy over the rest of the world, will be wiped out. They will then get to experience true worldwide equality and fairness. Enjoy. That’s not Canada. That’s *Quebec*, now “governed” (and I use the word loosely) by a woman who calls herself ‘Prime Minister’ as if she were a co-equal with Stephen Harper, and who is actually just a tribal fascist thug whose entire province depends upon one-third of its budget being provided by the Rest of Canada. Luckily, her government is a minority and the other parties are indicating that the latest language law proposals will not pass. The separatists are quite delusional. Unfortunately there are about 2.5 million voters who are ‘low information’ voters in this context. Of course, they are generally the monolingual francophones who get all of their news and information from Radio Canada (which makes NPR look ‘balanced, informative and truthful). As you say all governments do stupid things. So do most organizations, people used to get upset when I would say that the corporate staff should be cut until they don’t have time to ask stupid things. May be that is the answer to many things, just keep cutting government until they just don’t have time to do such stupid things. You can’t blame the whole of Canada for the actions of a single province! Stool samples?!?! I’d gladly mail Joe Biden a couple of mine! And these jerks make more money than folks in the in the private sector.. Mon Dieu..
Yeah, but this is not so much a result of tax-and-spend big government liberalism (although that IS the ideology of most Quebecois), but rather the result of Quebecois nationalism and separatism and refusal to coexist with Anglo-Canadians. Bilingual countries don’t work – that includes Canada. The Quebecois need to be granted their wish of seceding from Canada. Then let’s see how well will they fare.